Three days after a trio of space station fliers returned to Earth, a Russian cosmonaut, a German flight engineer and a NASA physician-astronaut rocketed into orbit aboard another Soyuz spacecraft Wednesday, setting off after the lab complex in the first step of a two-day rendezvous. The Soyuz MS-09/55S’s carrier rocket thundered to life and climbed away from Yuri Gagarin’s launch pad at the Baikonur Cosmodrome in Kazakhstan at at 7:12:39 a.m. EDT (GMT-4; 5:12 p.m. local time), the moment when Earth’s rotation carried the launch site into the plane of the space station’s orbit. Looking on was Jon Huntsman, the U.S. ambassador to Russia, his German counterpart and Sigmund Jaehn, 81, who became the first German in space in 1978 when he represented East Germany aboard the Salyut 6 space station. 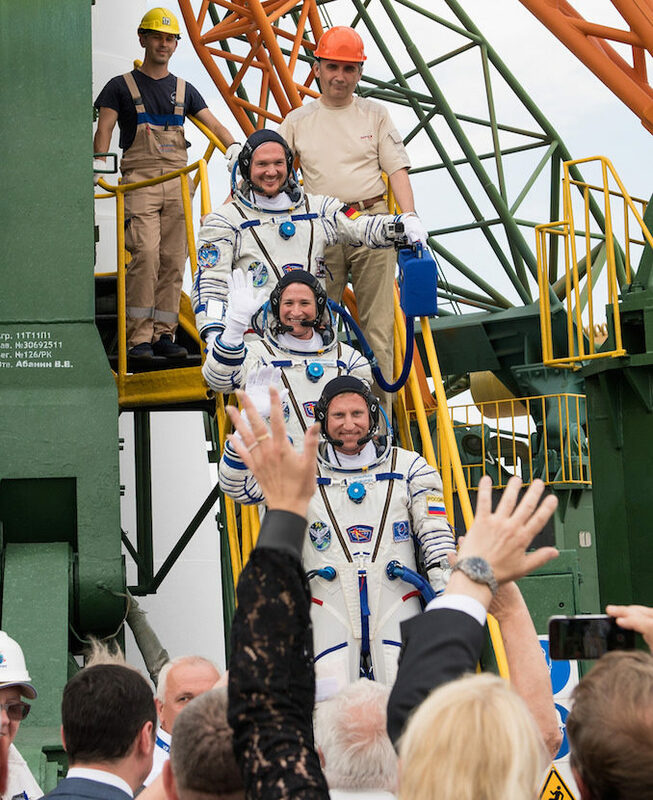 Strapped into the crew module’s center seat was vehicle commander Sergey Prokopyev, making his first flight, flanked on the left by co-pilot Alexander Gerst, a European Space Agency astronaut, and on the right by Serena Auñón-Chancellor, a NASA astronaut and flight surgeon. Gerst, a prolific user of Twitter who spent 165 days aboard the station in 2014, posted observations all the way up to the moment he boarded the rocket. He did not have long to wait. Live television from inside the cramped capsule showed all three crew members calmly monitoring cockpit displays as the Soyuz accelerated and climbed toward orbit, seemingly relaxed and reassuring flight controllers at the Russian mission control center near Moscow that all was well. 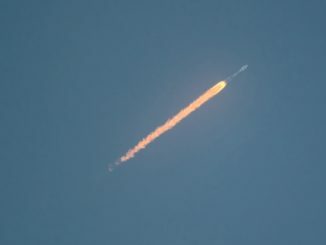 In what is believed to be a first for the Russians, a camera mounted outside on the rocket provided spectacular views as the Earth dropped away and the booster’s spent stages were jettisoned, views familiar from U.S. rockets but never seen before during scores of earlier Soyuz launchings. 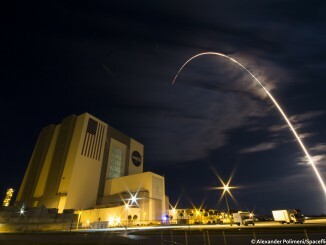 The workhorse rocket did its job with no apparent problems and eight minutes 45 seconds after liftoff, the Soyuz spacecraft was released to fly on its own, its solar arrays and antennas unfolding as planned. 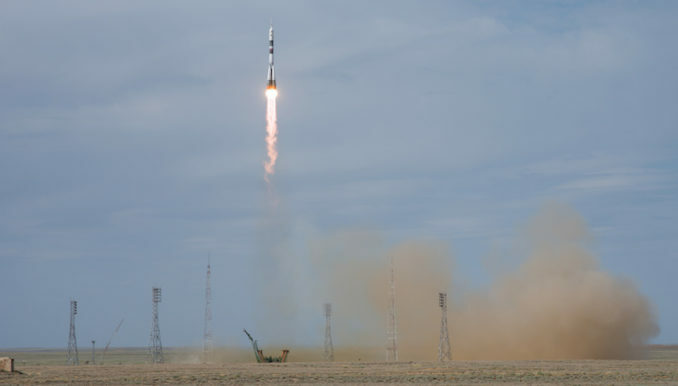 If all goes well, Prokopyev and Gerst will monitor a carefully planned sequence of rendezvous rocket firings, catching up with the space station Friday and docking at the Earth-facing Rassvet module around 9:07 a.m. 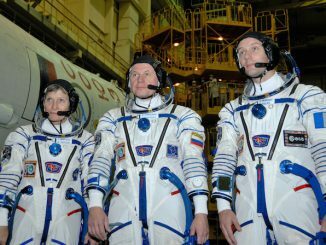 They will be welcomed aboard by Expedition 56 commander Drew Feustel, flight engineer Ricky Arnold and cosmonaut Oleg Artemyev. In a rapid-fire crew rotation that will minimize any disruption to space station research, Prokopyev, Gerst and Auñón-Chancellor are replacing yet another Soyuz crew that returned to Earth Sunday — Soyuz MS-07/53S commander Anton Shkaplerov, Scott Tingle and Japanese astronaut Norishige Kanai. The new crew faces a particular busy first few weeks in orbit with a U.S. spacewalk on tap, the arrivals of Russian and American cargo ships and a full slate of scientific research. Making her first space flight, Auñón-Chancellor is a veteran NASA flight surgeon who originally was assigned to a mission taking off later this year. She was moved up to the Soyuz MS-09 crew after astronaut Jeanette Epps, one of the original crew members, was unexpectedly bumped from the Prokopyev-Gerst crew in January. Citing privacy issues, NASA provided no explanation. Epps had no public comment and Auñón-Chancellor would only say she did not expect any problems working through an accelerated training schedule. She credited Gerst with helping her with emergency training in a compressed timeline. Auñón-Chancellor should be well suited for life aboard the space station. She spent more than nine months in Star City near Moscow supporting medical operations with space station crew members, two months in Antarctica searching for meteorites as part of a scientific expedition and later served as an aquanaut aboard the Aquarius underwater laboratory. She and Gerst were selected as astronauts in the same 2009 class and she had already met Prokopyev during her stint in Moscow before being assigned to the Soyuz MS-09 crew.